Why is it girls in Greece wear all-black to go clubbing? It just makes you disappear in the dark crowd... Last night I went out clubbing first time after two years (I'm a rather homey person) and I took advantage of the opportunity by wearing my bright mustard yellow skirt, silver-gray top and white onyx necklace. Nice and bright. Yellow skirt, BENETTON. Silver-gray racerback top, BERSHKA. Black top (layered underneath), ATTRATTIVO. Black leather obi belt, some shop in Volos. White onyx bead necklace, made by me with beads bought in Turkey. love the skirt! :) yey for clubbing. i need to go too. it has been tooo long. too long that i can't even remember. really cool outfit for clubbing, makes you stand out from the crowd like you said. i love the color combination! 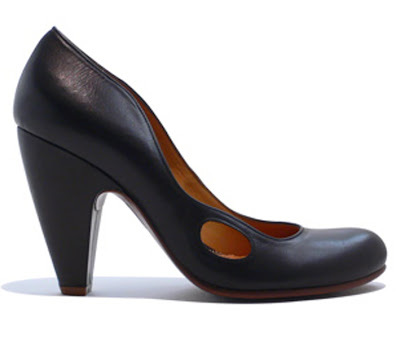 i think i am becoming a huge fan of chie mihara shoes through ur blog! this is my dream heel. I like the thought behind the outfit too. True, most Greek girls would go for black which is the easy solution. Also it is believed to hide all imperfections. I think a bit of colour lifts the spirits and draws the attention away from them. I am actually studying in Thessaloniki, so that i why I travel every month and along take the opportunity to shop here. But yes, we do not have my fave brands in Bulgaria. Oooh, I love that little cut-out in the shoes. shoes look so unique and one of a kind. i really like that you are not one of all those girls in black! very cool! I always drown myself in sequins when clubbing. I SO agree - if you're going to a dark place, why not wear brights? Seems like the perfect place, in fact, as even garish colors will look muted. That tank is fantastic, and I'm DROOLING over the shoes. The top is so beautiful. I love the silver! it's true! when i go out at night (which happens so rarely, homey person too!) all I can see is black! You're right! why don't people wear more colour?! you've managed great with the yellow skirt. love it! and the shoes too! ps: I got so lucky to find those, even I was bewildred! καλησπέρα κι απο μένα...έχω εξαφανιστεί αυτές τις μέρες αλλά είναι για καλό. σύντομα θα γράψω κάτι. περισσότερο όμως άρεσε στη δασκάλα μου του cellou (είναι ρωσίδα). όταν μπήκα στο μάθημα την προηγούμενη εβδομάδα μου είπε "Φωτεινή.. τί ωραίο παλτό, σαν από τον 17ο αιώνα...". - το σάββατο γνώρισα και τον διάσημο φίλο σου L.R. α και ευχαριστώ τόσο πολύ που είδα την αφεντομουτσουνάρα μου στα 10 loveliest blogs σου! Ασυνήθιστος συνδυασμός για τα ελληνικά δεδομένα,όπου το τρίπτυχο μαύρο(συνήθως αρκετά αποκαλυπτικό)σύνολο-γόβες κ τσαντάκι υπερπαραγωγή βασιλεύει! Ειδικά η κίτρινη φούστα κάνει το σύνολο πολύ "φρέσκο" κ fashionable..
Love the shoes! Chie Mihara is the best. I love this shoes!It is perfect!